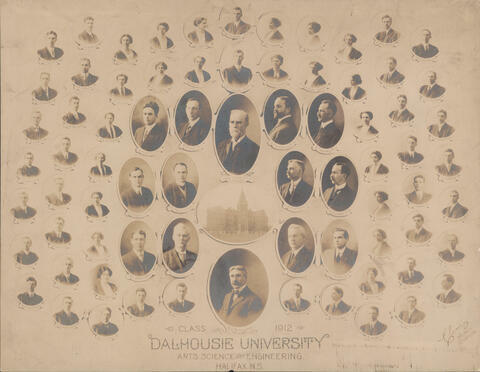 Item is a composite photograph of the 1912 faculty and class of the Dalhousie University faculties of Arts, Science, and Engineering. The photograph consists of portraits of A. S. MacKenzie (President); H. Murray; C. L. Moore; D. S. McIntosh; H. P. Jones; E. MacKay; A. MacMechan; John Forrest (Ex-president); R. Magill; J. 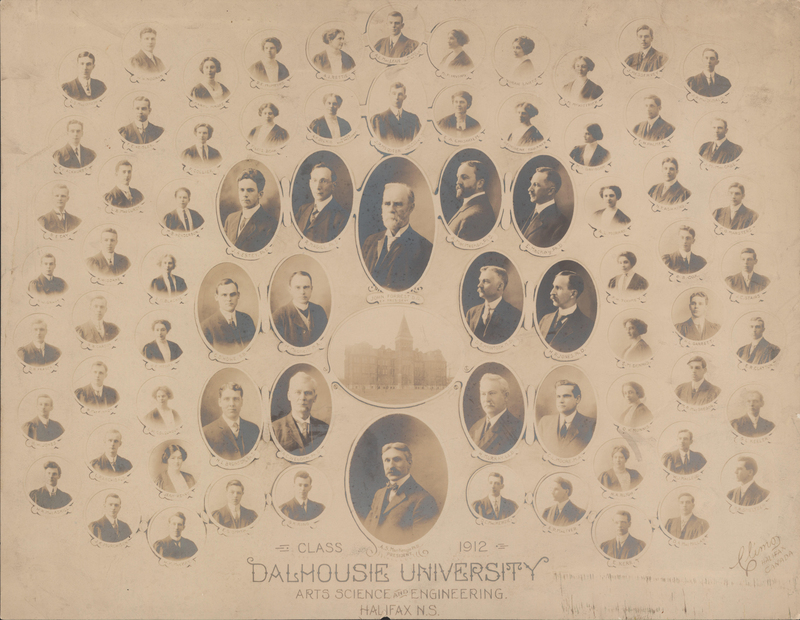 A. Estey; M. Macneill; C. D. Howe; H. L. Bronson; R. C. Weldon; D. C. Mackenzie; A. P. MacIver; E. Kerr; D. A. MacMillan; H. P. Smeltzer; W. J. MacLeod; H. A. Bligh; G. L. Keeler; M. R. MacGregor; D. K. Munnis; S. M. Dennis; H. L. Garrett; J. C. Stairs; D. S. Cox; F. H. Toomey; A. L. Murray; N. T. Ashkins; C. G. Marsters; J. M. MacCabe; M. I. Davidson; F. H. Palmer; J. A. MacDonald; J. Messervey; L. M. McKittrick; Georgene Faulkner; E. A. Chisholm; Nora Lantz; M. P. Irving; J. P. McQueen (Class President); A. L. MacLean (Class Secretary); A. I. Rettie; A. K. Dickie (Class Vice President); B. E. Mumford; Fillis Boar; Mabel Magee; F. Collier; W. H. Noonan; D. S. MacIntosh; E. V. Ackhurst; F. E. Heisler; R. E. Day; L. B. MacCurdy; M. B. Henderson; E. M. Blackie; H. W. Doane; G. W. Grant; D. R. Fraser; R. B. Carson; G. K. King; E. S. Smith; W. K. Mackay; Jean Henry; J. K. Murchison; W. R. MacAskill; L. P. Archibald; H. W. Jones; L. W. Colquhoun; R. J. MacKinnon; and J. E. Henry arranged in several rows around a photograph of the Forrest Building.